Are you a parent whose child suffers from ADD/ADHD/attention issues? Some people will tell you that the best way to deal with your ADD/ADHD child is by disciplining and teaching them how to be organized. Others will say that you must go to the doctor’s to get prescription meds. Who should you listen to? What’s the best thing to do? So many questions are floating around in your head and it’s so difficult to make decisions like these, because they have the potential of affecting your child’s wellbeing and future. Well, one safe and reliable option is to give your child a gentle brain-boosting supplement that helps to improve focus and reduce anxiety. As a parent, the last thing we want to do is spent lots of money on a product that will cause our children to have bad side effects. To avoid both these things, look for a product that has natural ingredients and of course, comes at a good price. Creekside Natural Therapeutics has a product made for kids with attention issues called Focused Mind Jr. We’re just as curious as you are about it, so let’s put our review caps on. There’s only three ingredients in the mix and yes, Creekside believes that this is sufficient to make your child more concentrated and focused at school. Are they right? Well, these three ingredients do in fact boost brain function. Phosphatidylserine, for instance, prevents stress buildup and helps to improve your abilities of recalling memory. DMAE has been shown to help people reduce brain fog and concentrate for longer, while Inositol helps to lift mood and general temper. The decision to include these three ingredients is a good one because they’re all relevant nootropic compounds that in one way or another improve mental performance. But here’s the issue with this formula – the main thing that a supplement for ADD/ADHD kids should be able to do is produce calmness. Kids can’t focus because there are a million different things going on in their mind and because every single stimulant within their environment causes a reaction. If a product can help the child to calm down and feel more relaxed, the tendency to get distracted and act hyperactive decreases. At least one calm-inducing ingredient should have been included in the blend i.e. L-Theanine. 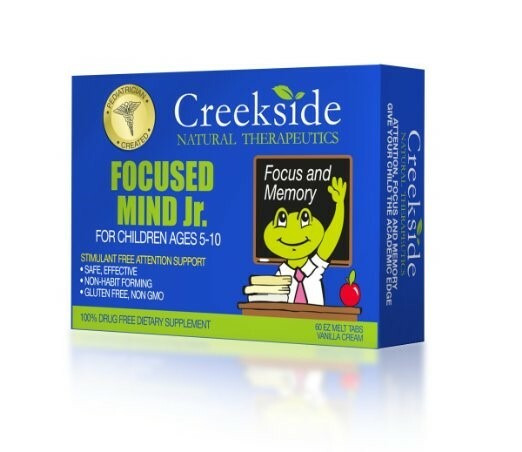 Test Results: Creekside Focused Mind Jr.
Parents with ADD/ADHD kids say that this product mostly helps their kids learn and memorize better in school. Your child may be very smart, but attention issues has prevented him/her from getting those straight A’s in school. While Focused Mind Jr. does not improve intelligence or increase IQ in any way, it may be able to help your child form and recall memories with more ease. Creekside Focused Mind Jr. is formulated in a way that won’t cause undesired results. The cognitive boosting ingredients in the formula may cause a headache but this is very rare and should not happen for regular cases. A pack of Focused Mind Jr. contains 60 vanilla flavored melt tablets and costs $18.99 on Amazon.com. Once you buy the product, make sure that you give your child one tablet in the morning and another in the afternoon everyday with a meal. You can get a 30% discount if you buy the 3-pack, which is available on Amazon’s checkout. Focused Mind Jr. is not a bad option if you’re looking for a simple, affordable nootropic supplement for your child. With three effective ingredients in the formula, including inositol, phosphatidylserine and DMAE, there’s a very good chance that your child will experience brain-boosting benefits within the first month of use. So if the only thing you’re looking for is improvements in memory and mental clarity then go for it. Some parents, however, are on the lookout for a product that can help their child feel calm, more focused, with improved memory and with higher motivation. In order to get all these benefits, go with an option like Lumonol Prep by Avanse Nutraceuticals. Their company’s original supplement for adults impressed us beyond what we expected, so it was no surprise when we saw that their formula for kids & teens includes some of the best and purest ingredients to boost focus and memory. You can get your child a bottle of Prep in three different flavors (orange, cherry or blueberry flavored) by going here.